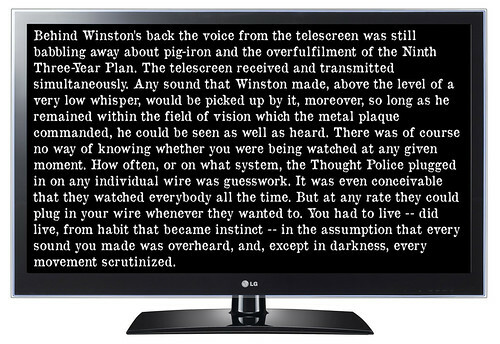 George Orwell's 1984 is sponsored by LG: "The telescreen received and transmitted simultaneously. Any sound that Winston made, above the level of a very low whisper, would be picked up by it,", a photo by Teacher Dude's BBQ on Flickr. Yahoo webcam images from millions of users intercepted by GCHQ. "Britain's surveillance agency GCHQ, with aid from the US National Security Agency, intercepted and stored the webcam images of millions of internet users not suspected of wrongdoing, secret documents reveal." Traditional Greek bell ringers - Thessaloniki, Greece, a photo by Teacher Dude's BBQ on Flickr. 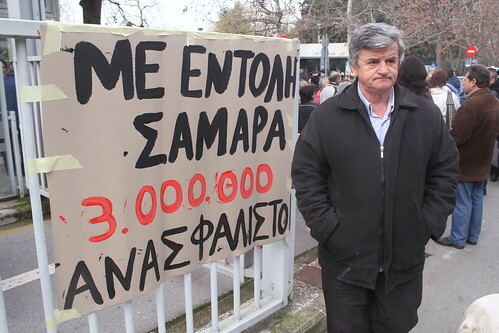 Greek farmers protest over new tax laws, a photo by Teacher Dude's BBQ on Flickr. 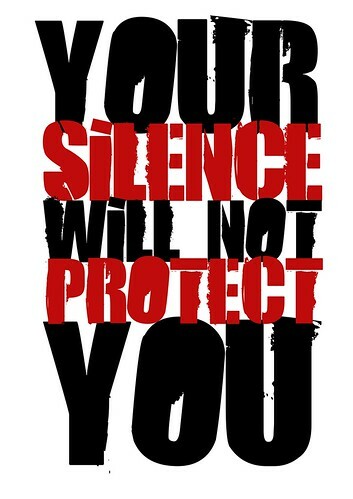 Your silence will not protect you - Audre Lord, a photo by Teacher Dude's BBQ on Flickr. 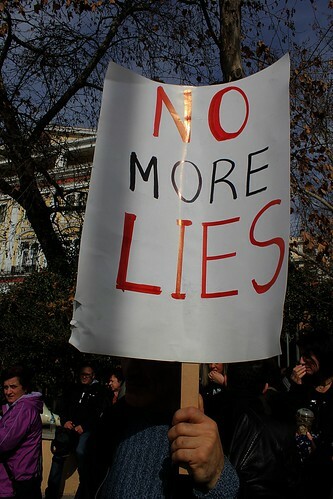 No More lies - Greece, a photo by Teacher Dude's BBQ on Flickr. With the crisis dragging on in Greece, voters are growing ever more angry at the lies and spin the government coalition parties employ to distract from their corruption, incompetence and lack of vision for the future. In May the country will vote in both local authority and European parliamentary elections and if current opinion polls prove correct, then this mark that end of the monopoly on power the nominally socialist PASOK and far right New Democracy parties have held since the late 70's. PASOK in particular, is likely to hardest hit with possibility that its share of the vote will be as low as 4%, a startling decline from the 44% it won in the 2009 general elections. 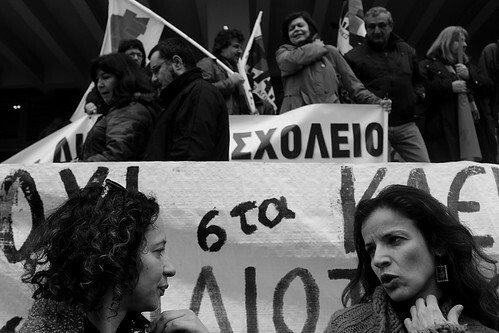 New Democracy's base is also shrinking as people,sick of austerity and endless finance scandals turn their back on them, many changing allegiance to the neo-Nazi Golden Dawn party . The position of the two main parties is not helped by the fact that between them they have 270 million euros in non-performing loans, which have been serviced since January 2013, making them technically bankrupt. With the prime minister announcing new taxes on food, property and cigarettes, the chances that his New democracy party will fall from second place to third place behind SYRIZA and Golden Dawn should not be ruled out. Whatever the final tally is poor results in May's elections will further increase pressure by party supporters and backbench MPs on PM Antonis Samaras and deputy PM Evangelos Venizelos to step down, so opening the way to more instability and the possibility of new national elections in the summer. 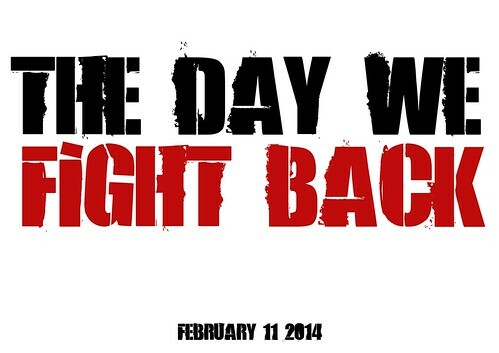 The Day We Fight Back. February 11 2014, a photo by Teacher Dude's BBQ on Flickr. "In January 2012 we defeated the SOPA and PIPA censorship legislation with the largest Internet protest in history. Today we face another critical threat, one that again undermines the Internet and the notion that any of us live in a genuinely free society: mass surveillance. Together we will push back against powers that seek to observe, collect, and analyze our every digital action. Together, we will make it clear that such behavior is not compatible with democratic governance. Together, if we persist, we will win this fight." 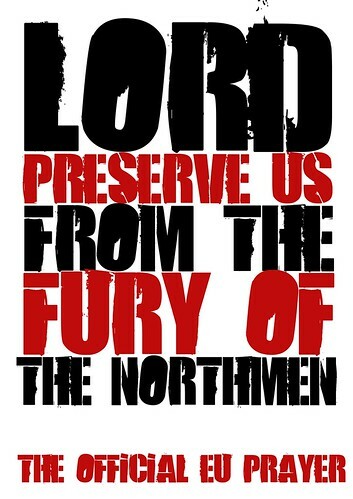 Lord save us from the fury of the Northmen" The official EU prayer (southern version), a photo by Teacher Dude's BBQ on Flickr. 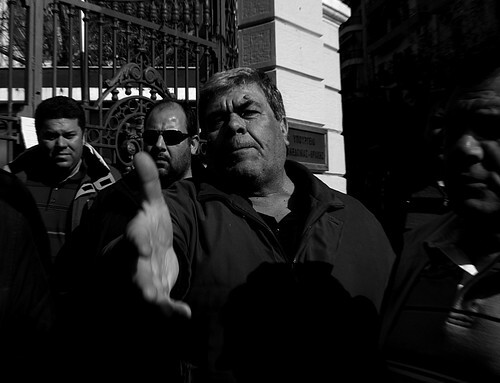 Anti-austerity demo in Thessaloniki, Greece, a photo by Teacher Dude's BBQ on Flickr. 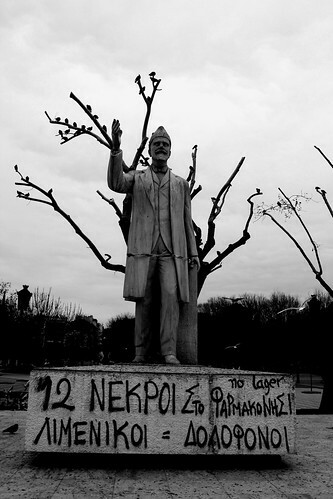 "12 dead on Farmakonisi. Coast guard = Murderers"
"12 dead on Farmakonisi. Coast guard = Murderers", a photo by Teacher Dude's BBQ on Flickr. ten children aged between one and nine years old and three Syrians. " 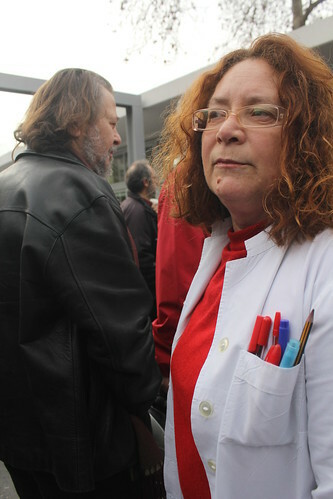 Staff and protesters demonstrate against health care cuts - Greece, a photo by Teacher Dude's BBQ on Flickr. 1 in 3 Greeks are now unable to access basic public health care as they no longer have health insurance. Whilst browsing through an old copy of National Geographic from November 1970, I came across this quote from an article entitled, Behold The Computer Revolution. "What if computer-equipped authority, insufficiently restrained, should turn hyper-inquisitive someday? If every purchase one makes, down to the last 10-cent newspaper, is recorded by a computer, showing where it was made and at what time; if millions of telephone conversations can not only be recorded daily but instantly scanned to pick out key words considered alarming by the surveillance officers…. The implications surpass the horrors of George Orwell’s 1984. Dr. Jerome B. Wiesner, Provost of MIT, has said that the computer’s potential for good, and the danger inherent in its misuse, exceed our ability to imagine. Wouldn’t that be the worst it could do—to become an instrument of tyranny, propelling mankind into a new Dark Age?" That frightening glimpse into a nightmarish future has become reality with government organisations such as the NSA and GCHQ using computer systems millions of times more powerful than the lumbering beasts depicted in the article, systems so powerful that they can hoover data in the form of phone calls, emails, internet surfing patterns and the like from the entire planet. Yet such data is collected and used with no thought given to the rights of US and non-US citizens alike, it's scale so vast and so inclusive that such oversight has become, in the words of Wiesner, "an instrument of tyranny". “Perhaps the greatest legal device to facilitate the movement from subject to citizen in England was the writ of habeas corpus—the command issued by the courts to the Crown to produce the body of the person being held, and to justify his imprisonment.